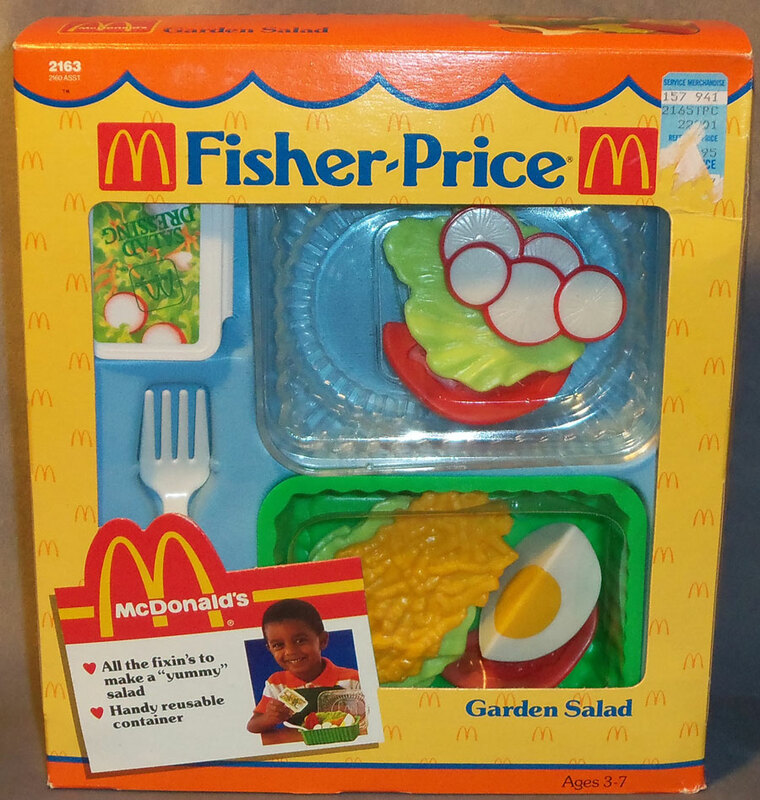 Description: This is a McDonald's® pretend food set that includes a plastic McDonald's® Garden Salad. Designed for children ages 3 to 7 years old. 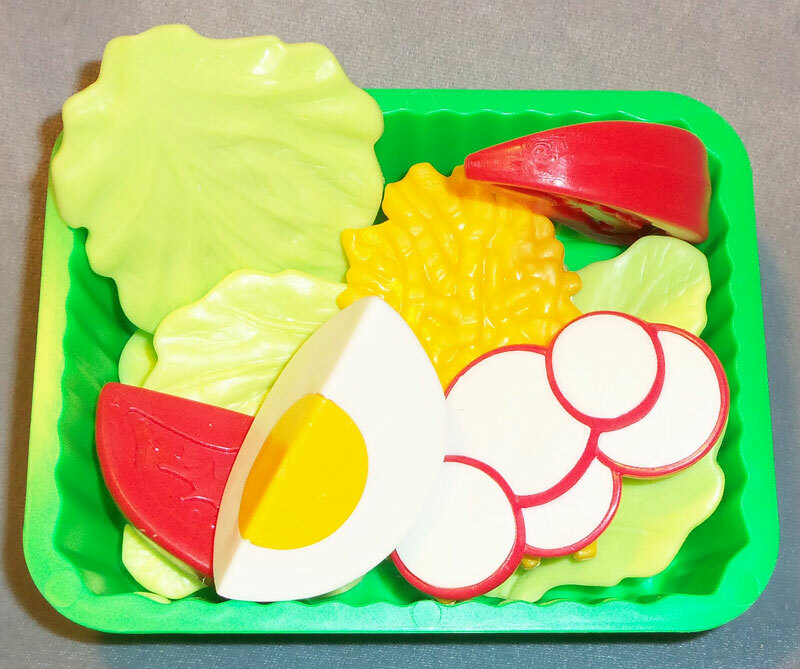 FPT7186 - Green rectangular salad container. The container is about 2 inches deep with ribbed plastic sides. Inside bottom of container is marked "Fisher-Price" and has a raised design of a heart with 4 "leaves". 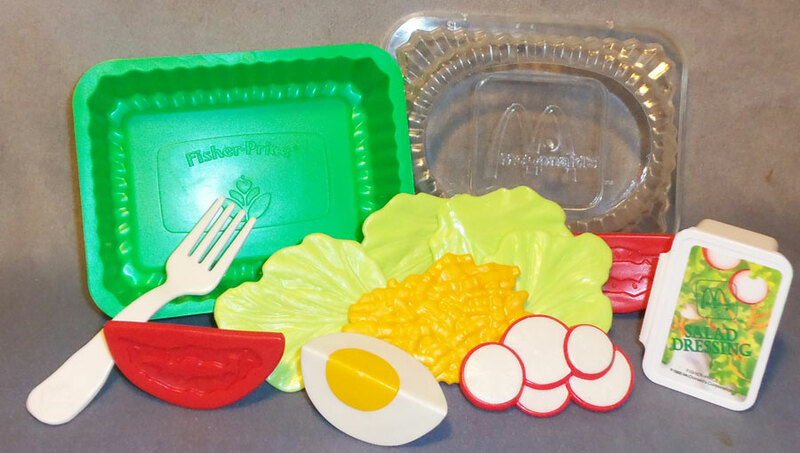 FPT7187 - Clear plastic rectangular salad lid with a "M" (for McDonald's) imprint in the top center. The lid is about an inch deep with ribbed plastic sides. 4 each - FPT7051 - Light green lettuce leaf that is flat with rippled lettuce vein textures on both sides. 2 each - FPT7188 - Red tomato wedge with imprints of tomato seeds on both sides of the cut wedge. FPT7189 - White radish slices with purplish-red edges. The slices are molded together (one mold) with 2 large slices and 2 small slices. FPT7190 - White boiled egg wedge with a rounded section of yellow yoke in the center. FPT44268 - Yellow molded shredded cheese mound (American Cheese). The mold is flat with long rectangular shredded cheese pieces molded together. 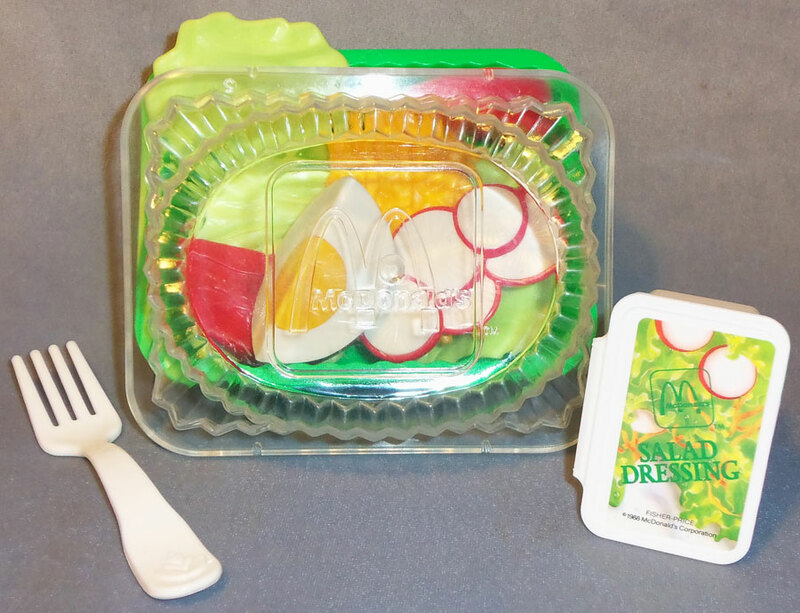 FPT7192 - Small white rectangular plastic container with a flip-up lid and a picture on top of the lid marked "McDonald's SALAD DRESSING" in green. FPT7193 - White plastic 4-spoke fork with an imprint of a heart shape and 4 "leaves" below it on the end of the handle. FPT7194 - This set was sold in a 8-7/8" long, 9-7/8" high, 2-7/8" deep display box.